May is the peak month for catching Lyme Disease or other tick-borne diseases with last year’s adults and this year’s nymphs of the black-legged tick both actively biting. It took me nearly two years to recover from Lyme Disease & Babesia so I have adopted some strategies to reduce the likelihood of being bit by a tick when I am out enjoying the outdoors. I hope you’ll take some steps to keep yourself safe too. 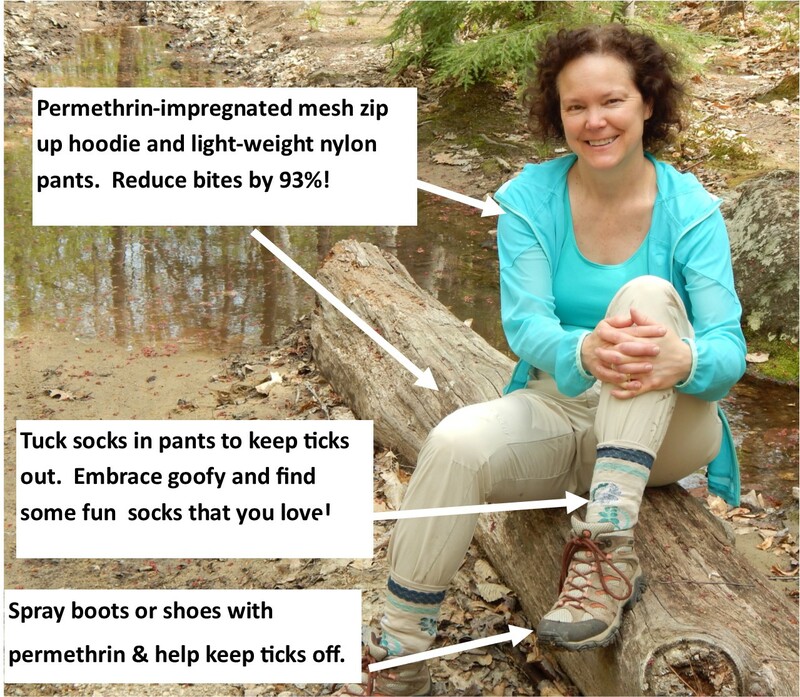 During the month of May I wear my “tick suit”, permethrin-impregnated clothing which has been shown to reduce tick-bites by 93%. I also spray my shoes & boots with permethrin since most ticks are found on the ground or down low on foliage. I also embrace looking goofy and tuck my pants in my socks to avoid ticks crawling up my pants.It is a great excuse to look for some fun light-weight hiking socks – smartwool are my favorites! When it gets so hot that I can’t stand wearing my long pants I have taken to wearing fun-patterned knee socks sprayed with permethrin. The idea is they will die or abandon the climb up my leg to get to my skin. Ticks die when they dry out so are less active in the mid-summer. Besides the tall socks, I do my best to stay out of damp places trying to avoid walking through tall grass, or brush and sit on rocks away from foliage when I stop for a rest. My back up plan is to always check myself head to toe at least once a day during tick season. The quicker you get them off you, the less likely you will get sick! Happy Spring! I hope these tips help you to enjoy the great outdoors and stay healthy. Testing ticks – tests on ticks are very accurate. Tests on people are not. Test the tick that was attached to you so you know what diseases it was carrying. Test your tick: results worth their weight in gold! ← Getting ready to speak at our annual Lyme Disease Awareness Event, June 7th. Great tips! Thanks for sharing all of these!